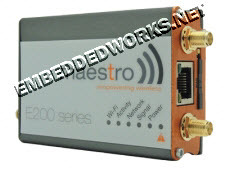 The E206 can be configured through an easy-to-use web interface;a configuration wizard will help the user setting-up the routerstep-by-step and select their primary and redundancy network;advanced configuration such as VPN and Wi-Fi hotspot setting arealso directly available through the web interface. Onceconfigured, a comprehensive set of 6 LED on the top of thealuminum alloy casing will help the user ensuring the deviceoperate as needed. Remote management is also available through anHTTPS connection. With high-speed cellular (3G and beyond), WAN, LAN and Wi-Ficonnectivity (802.11b/g/n), the E206 is a highly versatile,reliable and rugged router designed for mission-criticalenterprise applications requiring faultless connectivity. The E206 comes in two models; the cost-effective HSDPA ensuresalways-on connectivity for 2G migration or low-latencyapplications such as energy and sales & payment, while theHSPA+ penta-band is ideal for deployment in vertical marketsrequiring high-speed or global roaming such as security andtransportation.